Having Duplicate Contacts can be sometimes annoying particularly when searching for a contact and later found out that the contact is more than one. Not only that, it can also take some spaces from your phone memory or sim card depending on where your contacts are stored. This problem do happen to all smartphones including iPhone and Android devices. However, the problem occur when your Android or iphone creates two copies of contact data by syncing various accounts or E-mail on your device. If you decide to remove it manually, it might be time consuming so is better to make use of contact removals tools for instant solution to contacts duplication. Using Phone Contact - You can delete duplicate contacts using built-in phone contacts merging feature by going to Contacts App then tap on menu button and tap on Merge Accounts then merge from Google and select OK. Your account will be merged immediately. Using Gmail - You can remove Duplicate Contacts using your gmail account by opening your gmail and tap on MAIL from the left menu and tap on select Contacts from the drop down menu and all your contacts attached to your email will be shown and then tap on MORE at the top of the screen and select find and merge Duplicate from the drop down menu and finally uncheck the contacts if you want to keep them or click on merge options to merge all your contacts instantly. Using A Dedicated App - You can also use a dedicated app like Duplicate Contacts to remove all your Duplicate Contacts On your Android device. Using Contact Apps - You can use your contact app to remove all Duplicate Contacts On your iPhone by going to your contacts list and locate the contact you want to delete and tap on the selected contact to open the details and tap on EDIT in the upper-right of the screen. Then scroll down to the bottom of the contact and finally delete it. If your iPhone is connected to your icloud account, the contact will be deleted on all connected device. Using Groups - With this method, you will be able to hide categories of contacts without deleting them completely by tapping on the group button at the top contact screen and uncheck the group from the list to hide them and finally click on Done when completed. Using Or Deleting All iclouds Contacts - You can remove your contacts from icloud account that is if you have synced your Contacts On your icloud account. So you have to tap on the settings on your home screen and select icloud to open all your synced Contacts. Then search for contacts and toggle it off then tap on Delete from My iPhone option to remove all the contacts which you have synced with your iCloud account. Note: You can also use this method to remove all Contacts synced by other email addresses by going to settings>>mail/calendar and toggle off contact syncing. Using Your Address Book Or iTunes - If your device are synced with your Mac or outlook on your PC/desktop, you can remove them by going to Address book>>locate the contact and press Command + Click (for Mac) or Ctrl + Click (for PC) to select multiple contacts that are not in any way next to each other or press Shift + Click to select the contacts that are next to each other. In address book option for the Mac, you can click on Edit>>delete cards and on a PC, go to your contact lists>>Actions >> Menu >> Delete Contact. Note: If your device is not synced wirelessly, kindly plug your iphone to the system and open iTunes menu and select your iPhone at the top right of the iTunes windows and tap on Info and enable Sync Contacts >> All Contacts and finally tap on APPLY to sync iPhone and iTunes and delete the contacts you removed in your address book. 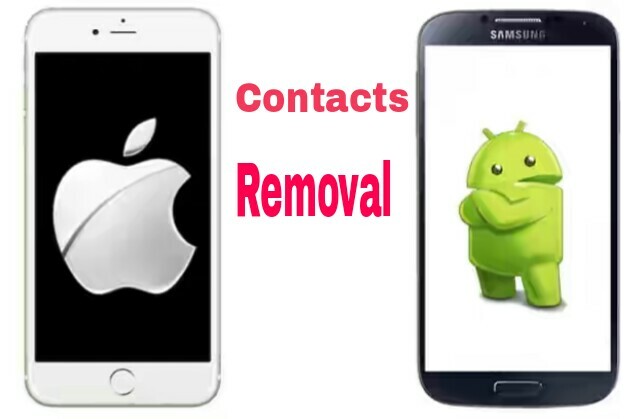 Using dedicated App - You can also use dedicated app just like Android to remove Duplicate Contacts from your device and be free from the annoying search.